​A Fitness Membership at Villari’s includes unlimited drop-in Kickboxing classes. We recommend 2-3 classes per week to maintain fitness and develop technique. ​Not sure how often you can take class? ​5 or 10 kickboxing classes! We've been teaching kickboxing in Madison since 1999. Master Murphy's unique program features highly trained martial arts instructors teaching fundamental skills in a fast-paced, high-cardio format. Our facility features a variety of standing bags as well as equipment for strength and agility training. 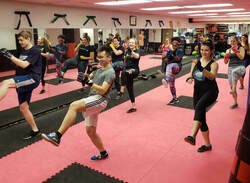 The Kickboxing class structure includes 5 minutes of stretch at the open and close of class, about 25 minutes of shadowboxing, which includes strength training and footwork drills, followed by about 25 minutes of resistance training (read: HIT STUFF). Instructors plan each workout around the students who show up for each class (that's YOU! ), and love getting requests so they can help you successfully meet your fitness and martial arts goals. Each instructor shows their personal martial arts style through the types of fun, fast-paced, martial arts exercises (and even some games!) that they teach. The combination of upbeat music and expert motivational coaching will help you push yourself to your highest potential. ​we sell hand wraps for $10! we sell gloves (starting at $18)! ​HOW TO WRAP YOUR HANDS! ​At the dojo, our instructors can help you adjust to make adjustments for your particular hand shape. Before you know it you'll be wrapping your hands like a pro! High-intensity classes taught by professional martial arts instructors in a fun, energetic format. Work out your stress hitting heavy bags and leave feeling great! ​​Our dojo is body-positive! We focus on developing strength and skills, meeting personal goals, and achieving physical empowerment. 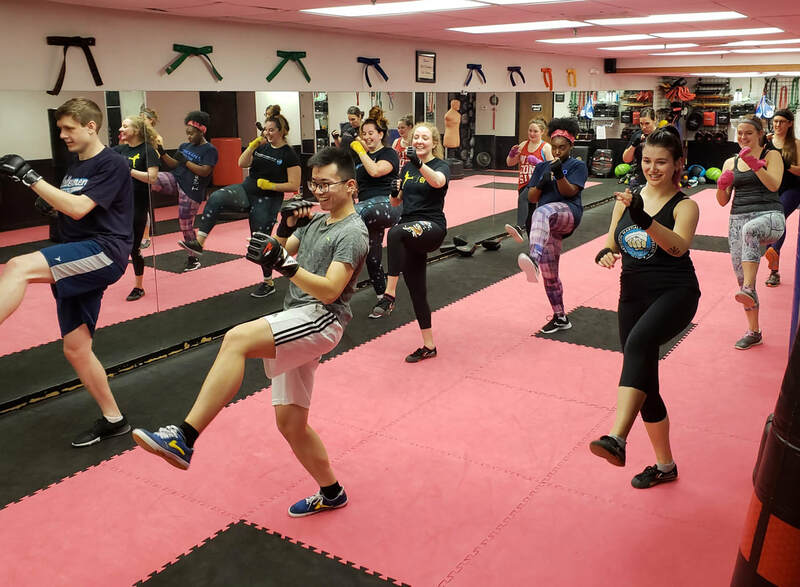 There's a reason so many of our students have found martial arts and kickboxing at Villari's to be the first fitness routine that they've made a long-term commitment to... ever. An example of how we teach how to do push ups. what keeps our kickboxers coming back for more? In brief: the instructors (they are all awesome; they make classes consistently informative, challenging, and fun; and they’re always willing to answer questions I have about techniques when I’m confused or curious for more information), the fantastic workouts, the stress relief I get from from hitting things in general, the re-centering that I get from hitting things in a controlled and focused way, the fact that I think I’m actually developing a bit of coordination for the first time in my life, and, finally, the sense of supportive community that I find at Villari’s whenever I’m there. I love the instructors and I love that I'm always learning something new. It never gets stale. You get what you put in. It makes me feel stronger and more confident. I come back because I LOVE IT!! Villari's helped this lifelong exercise hater change her 'tude! The instructors are friendly, encouraging and really good at keeping things interesting. I actually look forward to going to kickboxing, and I feel strong and powerful. If you're looking for a fun and encouraging environment in which to get in shape, you should definitely join us.